Summary: Retrieved from an orphanage by a preacher who needs an assistant, Widge is educated in English, Latin, and a curious shorthand of his master’s invention. With no thought of right and wrong, Widge obey’s Dr. Bright’s commands to write down sermons given in other towns. Then Widge is purchased from Dr. Bright by a brooding, fearsome man named Falconer. 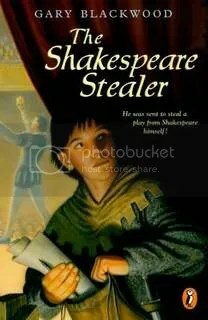 Falconer delivers Widge to a new master who tasks him with stealing a play from the Globe Theater’s playwright—a one William Shakespeare. Widge goes to carry out his duty, but ends up falling in with the company of players…and finding himself a real home for the first time in his life. Suddenly, Widge understands the meaning of loyalty, and of betrayal. With his master’s assignment hanging over him and Falconer watching his every move, Widge must confront the hardest moral dilemma of his life. Notes: A good companion book to a middle school student’s first Shakespeare play. Widge is likable enough, so the book is a fun way to introduce Elizabethan theater to young readers and actors.